The Waste Maid WM-358 Heavy Duty Garbage Disposal is a ½ HP high grade disposal at an affordable price point, with the heavy duty aspects to accommodate the tough jobs when needed. Waste Maid disposers bring a lot of features at a lower price without sacrificing overall quality in operation or durability (includes Lifetime Guarantee against Corrosion). The WM-358 uses higher grade materials than Economy and Standard models, and is suitable for higher traffic use. The WM-358 incorporates a Speed master Mounting System for quick, easy installation and replacement of old models. With the attached power cord, the WM-358 operates on your standard 120V household line voltage. The WM-358 comes with a lifetime corrosion guarantee, and a 8-year Manufacturer warranty. Operates at 120V / 375 Watts. 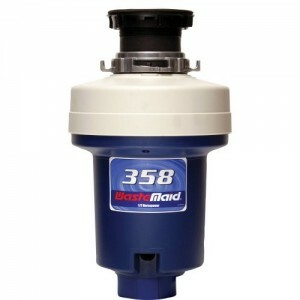 Waste Maid Garbage Disposals are the only brand of disposer with advanced BioShield technology incorporated into their grinder components. Every plastic component that comes in contact with waste particles incorporates anti-microbial compounds that breakdown bacterias and germs, prevent build-up of bacteria, mold and odors. The WM-358 uses a highly efficient design to grind faster, easier, and with less noise than competing brands. Waste Maid disposer models all include a TorqueMaster Grinding System which has a turntable-like blade design, reducing stress on the motor and blade. Septic Tank Safe.